If you want to look like a Cyberman and try to delete Doctor Who then maybe this hoodie can help you to look like one. This Cyberman costume hoodie makes you look just like a real Cyberman and the hood zips up all the way to the top so that it looks you are wearing a mask. Now you can stop worrying about running into a real Cybermen army as they all will think you are one of them. 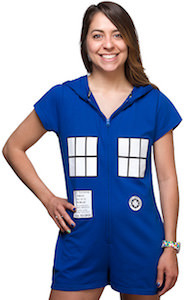 This Doctor Who costume hoodie comes in men’s sizes Small – XL and is made from 100% polyester and is something a true Doctor Who fan will really enjoy wearing.